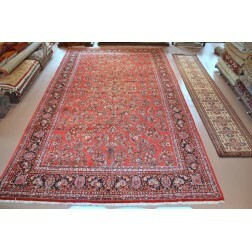 Our collection of extra large antique Persian rugs - ideal for larger rooms and spaces. Description:If you like to own a piece of history you got to have this rug. Antique Lavar Karmen rug.. This rug is an Antique Persian RUG circa 1920’s in Perfect condition. This rug has a very fine weave.. Here is a beautiful floral Antique Persian Tabriz from early 1930's it is in great shape for its age..
10' X 18' authentic Persian Sarouk/Sarook handmade with thick pile made out of 100% Natural wool. Gr..